The village of Gouarec, which is located in north-west France in the lovely department of the Côtes d'Armor in northern Brittany, is a jewel of a village that has a truly beautiful setting. The usual images conjured up by the word "Brittany"... those of crashing seas, long sandy beaches, dramatic cliffs and shellfish... can be set aside for a new and equally beautiful picture, once you have experienced Gouarec. As long as you don't mind not being directly on the coast, Gouarec could just be the perfect place to purchase a property in Brittany. (Remember, everywhere in Brittany is within reasonably easy access of the sea, so it doesn't matter as much as you might think.) If the idea of being close to the delightful Nantes-Brest Canal, with its shady tow-paths for walking and cycling, and its calm, cool waters for floating serenely along on a boat or barge appeals to you, then take a look at Gouarec. The scenery doesn't just extend to the canal, either, for the area around the village is said to be one of the most beautiful in inland Brittany, with acres of woodlands and pretty pasture, with an abundant wildlife of fascinating flora and fauna. The village is quite well equipped, and offers most of the basic amenities that you might expect. There are small shops, a supermarket, banks, bars, cafés and restaurants, so you don't need to leave the village if you don't want to. It's always handy to have everything you need on the doorstep, even though it's a good idea to have access to a car for days out. There is also a handy campsite situated right by the canal. Friday is market day in the village. This area is so lovely, and there is so much history and tradition to discover that you will never be stuck for something to do or a place to go. Very close by is the lovely, partly restored 12th century Bon Repos Abbey, which is worth visiting. It has regular exhibitions of contemporary art, a wonderful "son et lumiere" show in August, as well as a market in the grounds on Sundays (between March and October). 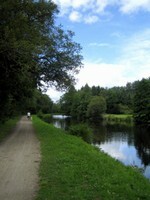 You can reach it by cycling or walking along the canal, or by driving there. Then you can take a look at the mediaeval town of Dinan, reputed to be one of the most delightful and best preserved in the region, or a little closer to home, see the river town of Guingamp. The ocean is never far away and the beaches of Brittany are so good that it is hard to make a recommendation... try them all to find your favourite! Sports fans will also find their favourite activities are easy to find in and around Gouarec, with plenty of places to walk, cycle and ride. Water sports fans need not travel to the sea for their fun, as there is a superb leisure lake called Lac de Guerledan, said to be the largest in Brittany, just a few minutes drive from the village. Here you can swim, fish, sail, windsurf or simply laze on the beaches to your heart's content, and if none of this appeals you can always take a look at the activities offered by the outdoor sports centre which is situated lakeside too. There is an airport at Dinard, and you can fly there direct with Ryanair or Aurigny Air. Those who prefer to travel by boat (and it is always good to have a car so that you can easily explore more of this lovely region) can take the ferry to St Malo and then drive on to their destination. Brittany prices (and perhaps more specifically, Côtes d'Armor prices) are escalating, as the area is ever popular with property seekers. Inland towns such as Gouarec, however, tend to offer more bargains than their seaside counterparts, so this could be a good tip if you are working on a budget. Do you know Gouarec better than we do? Do you have photos of Gouarec? Gouarec is located in north-western France. It lies in the south-west of the Côtes d'Armor department. Access: By air: Fly to Dinard, with Ryanair or Aurigny Air Services. By boat: The nearest ferry port is that of St Malo. 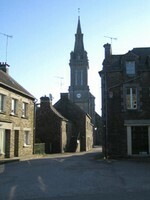 By road: The village can be found from the N164. Economy: The economy is largely agricultural. Interesting fact: The native inhabitants of Gouarec are known as "Gouarecais".